Iberostar is a Spanish hotel chain known for four- and five-star hotels in sun-drenched destinations. Iberostar Paraiso Maya Resort is a major five-hotel complex at Playa Paraiso in Playa del Carmen on Mexico's Mayan Riviera, located 30 minutes south of the Cancun airport. The Mayan Riviera is a wildly popular vacation area and Playa del Carmen is a hotspot with many all-inclusive resorts. From this base, families can explore beaches, Mayan ruins, snorkeling lagoons, and unique eco-theme parks such as Xcaret and Xel-ha. On the white sand beaches of Playa Paraiso, the Iberostar complex includes five all-inclusive resorts. While the Iberostar Grand Paraiso is for adults only, the other four hotels are all family-friendly. Two of these properties are at the Premium Gold category (upscale) and two are in the Premium category (moderate). Best of all for families, kids age 12 and under stay free at all four of the family-friendly Iberostar properties. The resort complex includes three-story buildings with guest rooms and suites, a conference center, shopping center, spa, fitness center, and golf course. The complex has a lush tropical setting where kids love to spot birds, iguanas, turtles, and even peacocks and monkeys. To make it easier for guests to get around the giant property, there is a trolley that makes regular stops at key locations. Guests from any of the resorts are welcome to visit the other sister properties and use the restaurants and facilities. While the four kid-friendly Iberostar resorts have similarities, there are differences. Iberostar Paraiso Maya (Premium Gold category) is the most upscale of the family-friendly options, with its massive lobby themed like a Mayan temple. It is the only resort in the Iberostar complex with Jacuzzis in the guest rooms and elevators in the buildings. Iberostar Paraiso Lindo (Premium Gold category) is also upscale and shares restaurants and other facilities with the Paraiso Maya. The five shared pools include a lake-style pool, lazy river, wave pool, kids' pool, and activity pool. Iberostar Paraiso Beach (Premium category) is a mid-range property that shares restaurants, pools and other facilities with the Iberostar Paraiso Del Mar. Iberostar Paraiso Del Mar (Premium category) is nearly identical to the Paraiso Beach aside from the decorative color scheme. All-inclusive vacations include lodging, most activities, and meals, drinks, and snacks 24 hours a day. Children age 12 and under stay free. Land sports include tennis a program of daily activities. Water sports include windsurfing, kayaking, scuba, snorkeling, and catamaran sailing. Kids club offers programs for ages 4 to 12. 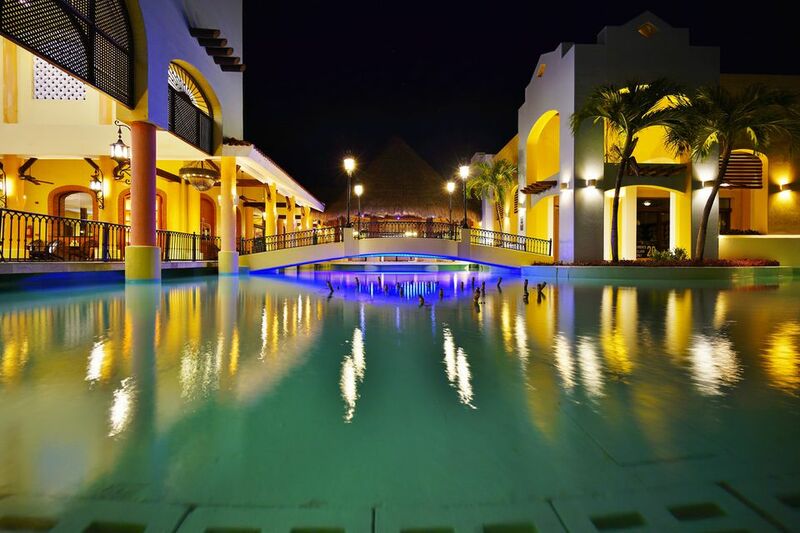 Guests can "dine around" and play at the other Iberostar Resorts in the complex. The adults-only Iberostar Grand Hotel Paraiso is the fifth resort in the Iberostar Playa Paraiso complex. The complex is huge, which can mean lots of walking if you plan to take advantage of all the restaurants and facilities. If you are bringing a stroller, keep in mind that the Paraiso Maya is the only property with elevators. Each guest at Iberostar hotels receives a wristband that gives access to other Iberostars at the same or lower level. For example, guests at a Premium Gold property can visit another Premium Gold or Premium property and use the amenities, children's clubs, and restaurants. Guests at Premium properties can visit other Premium properties to use the facilities there. Families staying at the Premium Gold properties that spend a day sightseeing can use the amenities, children's clubs, and restaurants at other Premium Gold and Premium properties in the area, including: Iberostar Cancun (Premium Gold), Iberostar Cozumel (Premium), Iberostar Quetzal (Premium), and Iberostar Tucan (Premium). Families staying at the Premium properties can use the facilities at any of the Premium properties listed above. This brief profile is meant to introduce this resort to family vacationers; please note that the writer has not visited in person. Always check resort sites for changes and updates.